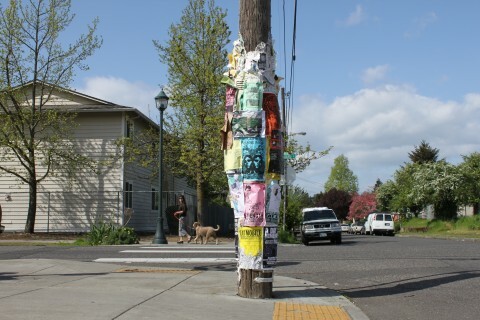 A ubiquitous example of making traces visible, these posted paper fliers pop up on wooden telephone poles all around the American urban landscape. It’s a low tech and user friendly way of submitting posts, sharing information, building a history. - It’s an open platform. Everyone can do it, everyone has access to both posting, editing and viewing posts. - Everyone knows how the system works, even people encountering it for the first time. The built up history demonstrates the rules – post up whatever you like. New entries cover up past ones. - What makes this posting system nice over time is that they leave behind traces. Passers by see posted advertisements and know what’s happening in the local area now but can also know what happened last week, or if peeling back further, can know what happened months ago. The history stays and builds. While the look and feel of posted fliers may not be an ideal visual representation, the system itself could easily be transferred to different contexts and work just as well.